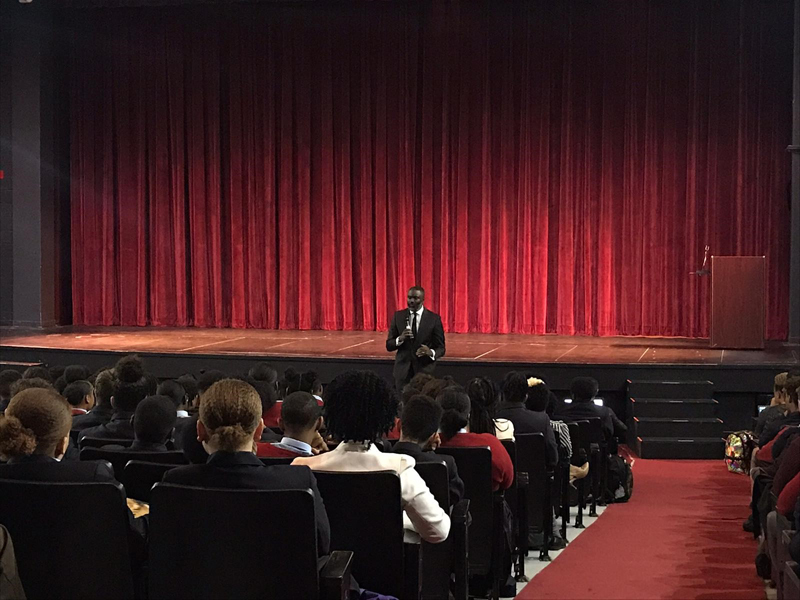 On Wednesday, January 30, 2019, Minister of National Security Wayne Caines spoke to CedarBridge Academy students about finding the greatness within each and every one of them. He conveyed to the students that there is indeed ‘greatness in this room’ and that if everyone continues to push themselves to meet their maximum potential, they will be able to contribute to a sustainable Bermuda for future generations. Minister Caines implored the young Bermudians to strive for excellence, and further reiterated that many opportunities are accessible here island wide once students remember to follow through on their Passion, Purpose and Plan. Minister Caines shared his journey with CBA students; he pushed aside all his struggles and ventured off to University where he studied law. This exemplifies that no matter what you have been through in your life, if you want to be great – persistence is key. By pushing himself, he was able to rise from being a moderate student, to becoming the CEO of Digicel, and is now the Minister of National Security. “Failure is not an option and it can never win if your determination to succeed is strong,” he told the students. Cap’n Crunch giving advice to students. You can’t make this up! He is a successful businessman, who was successful at being a CEO of the largest cellular company on the island. He was a excellent prosecutor for our Bermuda Judicial system. What are your accomplishments that you can be able to talk down on the Minister for trying to motivate our children? Since you have achieved so much why you ain’t speaking with the kids? Everyone makes mistakes or are you a “Christian” who makes them but gets to hit the reset button every Sunday? He is still a worthy role model. If you make a mistake and you’re genuinely remorseful for something you said, you don’t then dissemble and pretend you said something else. how he has the nerve to show his face in public is beyond many! @hmmm is Man served this country for many as a Prosecutor, he was then the CEO of Digicel for many years, he took that Company to heights it has never seen prior and will not see after. He at every stage volunteers, gives back to our community, and he is now one of the most visible, effective and hardworking Members of Parliament and you try and discredit him based on one dumb comment ?? That is the problem with people like you. You sit back and do nothing for our country and hide behind your keyboard and discredit others. Mr Caines, I appreciate you and your hard work. Keep on working for the people of Bermuda. We need people like you !! It would be interesting to know what those students were thinking during his speech. @Hmmm you are passing judgment on someone whom you do not know personally, only by what you hear or read in the media. Not very smart.